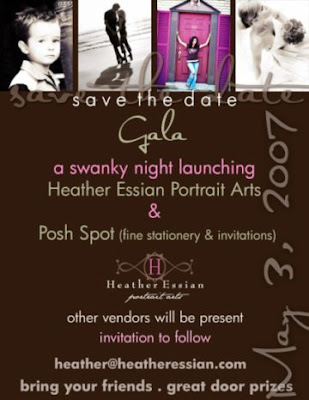 Come to a swanky party launching Heather Essian Portrait Arts and Posh Spot. Everyone is invited to come. Bring your group and have a great night on us. Complete with valet, wine, and great food! I will be displaying many print enlargements, coffee table books, albums, and other special edition prints. For those of you who do not know I also design custom Invitations and Stationery this company is called Posh Spot we are launching our Spring line so come check those out as well. We will have the amazingly talented florist Kristy Howington. She will be donating some awesome arrangements and services. There will be a Jewelery designer there as well as a few other special folks. All of our vendors will be donating a special service for our drawing during the evening. You could go home with something wonderful! Please send me your address if you would like to be on our mailing list, or if you know someone who would.